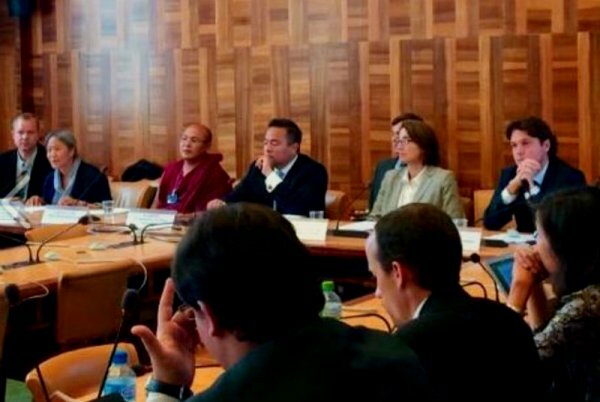 Held on 15 June 2015 in Geneva, the UN Human Rights Council’s event titled ‘Lockdown in Tibet’ included among its speakers Ms Sarah Sewell, Special Coordinator for Tibetan Issues at the U.S. State Department. In her statement, Ms Sewell drew attention to noticeable aggravation in civil rights restrictions by the Chinese Government. She later emphasized the severe desperation of the region’s inhabitants, putting it in contrast with the authorities’ indifference to their international commitments. Sarah Sewell, the U.S. State Department's Special Coordinator for Tibetan Issues, delivered an important statement at the UN Human Rights Council's event, Lockdown in Tibet, on June 15th, 2015. She began by noting the pertinence of talking about Tibet at the Human Rights Council, highlighting the blatant lack of human rights currently enjoyed by Tibetans, stating, "We believe that the Tibetan people, like people all around the world, should be able to enjoy their fundamental freedoms enshrined in the Universal Declaration on Human Rights. "The United States has consistently urged the Chinese government to uphold its international commitments to protect human rights and fundamental freedoms, specifically by ending the harassment, detention, and other mistreatment of individuals who seek to peacefully practice their religion, express their views or seek legal redress. We call on Chinese authorities to release Tenzin Delek Rinpoche and other prisoners of conscience, and to allow Dhondup Wangchen to be reunited with his family." Additionally, she addressed the issues of transparency in Tibet, and China's unwillingness to allow foreign media and diplomats to visit the region. Sewell noted that in the past four years, 35 out of the 39 requests made by the U.S. embassy and consulates have been denied. Illustrating the gravity of the situation in Tibet, Sewell referenced the rising numbers of self-immolations. "In the absence of peaceful avenues for the exercise of basic rights, people despair. The US, EU and former High Commissioner Pillay, all have urged China to address the restrictions on rights and freedoms that have driven some 140 Tibetans to set themselves on fire in protest. Finally, Sewell urged the Chinese government to seize the current opportunity to resume dialogue with His Holiness the 14th Dalai Lama, stating, "We believe the Dalai Lama is sincere and can be a constructive partner for peace and stability." "I urge members of the Council to join the United States in encouraging the Chinese government to live up to its international obligations to respect Tibetans' distinct culture, identity, and fundamental human rights, as well as respect international protocols on diplomatic relations and reciprocal access among states." At a side-panel of the U.N. Human Rights Council in Geneva Sunday with the U.S. Special Coordinator on Tibet, and former political prisoner Golog Jigme, Matteo Mecacci, President of ICT, said "Chinese Party leaders describe Tibet as the 'teeth of the storm' in a 'struggle of the ideological realm'. There are increasing dangers for Tibetans as a result of the deepening oppression, but at the same time young generation singers, artists and writers are leading a remarkable cultural resurgence, producing new songs, literature, poetry to define their identity and as a means of countering the Chinese state."